Fueled by his restored faith in humanity and inspired by Superman’s selfless act, Bruce Wayne enlists newfound ally Diana Prince to face an even greater threat. Together, Batman and Wonder Woman work quickly to recruit a team to stand against this newly awakened enemy. Despite the formation of an unprecedented league of heroes—Batman, Wonder Woman, Aquaman, Cyborg and the Flash—it may be too late to save the planet from an assault of catastrophic proportions. One of the most waited for films from DC Extended Universe (DCEU) is Justice League. In terms of films, DC really has their own ups and downs. After receiving moderate reviews for Batman v Superman: Dawn of Justice (2016), people got satisfied with Wonder Woman (2017) later on. That’s why people expect the same success from Justice League with Wonder Woman—or even a bigger success, seeing that we will see nearly all the DC superheroes. Here’s the thing. I kind of confused when I found out that Justice League would have 120 minutes running time, making it the shortest DC films to date. I don’t mean to compare but even The Avengers (2012) took 143 minutes when we already knew each superhero starring in that film while in Justice League, people who never read the comic basically doesn’t know about Aquaman or the Flash or Cyborg. So how the hell they could make a very short film when there are so many new characters to introduce. Well, two hours is not short but it is short when you think of a superhero film and moreover, a superhero film with many new superheroes to introduce. Up until that point, I am confused. Perhaps a bit of disappointed. But I still have high hope for the film. Unfortunately, I watched the film a little bit too ‘late’ since so many reviews were in the talk. People kept saying that Justice League isn’t as good as they expected, some even said that the film is so bad. Even Rotten Tomatoes gave this film a bad rating. 40% or something. Well, I don’t really rely on Rotten Tomatoes in terms of DC films because they really have a bad history in giving DC films ratings—at least up until lately, with the exception of Wonder Woman. I mean, Batman v Superman: Dawn of Justice is not that worse and neither is Man of Steel (2013). I think after Wonder Woman, Man of Steel is the second best with the exception of the prior DC films like when Christian Bale is still the Batman. Though I did agree that Suicide Squad is not that good but the film really didn’t deserve a very poor rating from Rotten Tomato. Anyway, let’s get back to Justice League. I have seen Batman films before but I don’t really remember about his character. Still, I think the character of Batman is not as vulnerable as what Ben Affleck has been portraying ever since Batman v Superman: Dawn of Justice. This vulnerable side of Batman is something new and I’m guessing that’s why most people don’t like Ben Affleck as the Batman. I personally don’t not like Ben Affleck, so I don’t mind him playing Batman as long as he executed it well. I don’t think it’s Ben Affleck’s fault if the character of Batman looked weak or vulnerable because surely it’s what the writers want. Gal Gadot still did her best performance in portraying Wonder Woman. I still think no other actresses can play the character of Wonder Woman as good as her. She really got it all. The look, the charisma, the sexiness, basically everything. Gal Gadot was able to do fighting scenes just fine—even perfectly well. It’s not a lie if anyone says Gal Gadot really outshine from other superheroes in the film because she really did—and not just because she is the only female superheroes. I don’t know about the comic, but I really hope there’s more to it about the introduction of the Flash, Cyborg, and Aquaman. I still think it’s not the smartest idea to introduce the new characters in an all-team-up superhero when we didn’t know a thing about them. It’s not a big of a deal when you’ve read the comic book, but it’s really a big deal to non-reader like me. I knew a little bit of the Flash because I’ve watched The Flash tv series for a bit, but that bit really didn’t give me a thorough explanation of the character either. They gave a very brief introduction to the new superheroes that I don’t have time to digest it all. Of all the new characters, I like the Flash the most. If DC films usually are more serious, the Flash a.k.a. Barry Allen made things lighter and more laughable. Ezra Miller really knew how to entertain people and how to make the audience laugh. His facial expression was so priceless that you can’t restrain yourself from not laughing. I can’t compare his performance with Grant Gustin, who played the role of the Flash in the series because I don’t think it would be fair either. I also can’t judge whether Ezra Miller is indeed the right actor to play the character of the Flash since I don’t read the comic book either. What I do know is that his performance in Justice League is really good and very much entertaining. I am not disappointed with Josh Momoa’s performance, but I was expecting something more from Aquaman. Ray Fisher also did good in portraying Cyborg but I too was expecting something more. Perhaps because I don’t really understand and know both characters that I found myself wondering for more. With the Flash, it’s likely that DC is trying to do humour approach like Marvel. Perhaps they started to realise that people like to laugh. People like to watch something that can make them laugh. It’s true but not entirely. At the end of the day, people watch superhero films because they wanted to be entertained with a good story, good action and if they can, good laugh too. Justice League did give us some laugh and some good action sequences. However, I can’t deny the fact that the story is a bit lacking. Not that I’m saying it’s bad. It’s just lacking at some points. Too many new characters to tell yet too short of time. This is not a spoiler because I think everyone knows that Superman is back. As to how I won’t say anything about it but let’s just say I am not fascinated by it. Since Warner Bros. has told us the comeback of Henry Cavill as Superman in Justice League, they lost the element of surprise. I think they should learn from Game of Thrones in terms of secrecy. I wasn’t surprised at all when Superman is back in the film because they’ve told us about the comeback in their conference in Comic Con. I think that’s what their biggest mistake. Another mistake that they made is, if I have to be honest, Justice League is supposed to be about Justice League but they failed to do it. Justice League is supposed to be all superheroes from DC combining powers to beat the villain. Somehow, they didn’t execute it that way and rather make it like it one certain superhero’s films. I am not saying who, but I was kind of disappointed. I was expecting that this film would be like The Avengers, but it wasn’t at all. 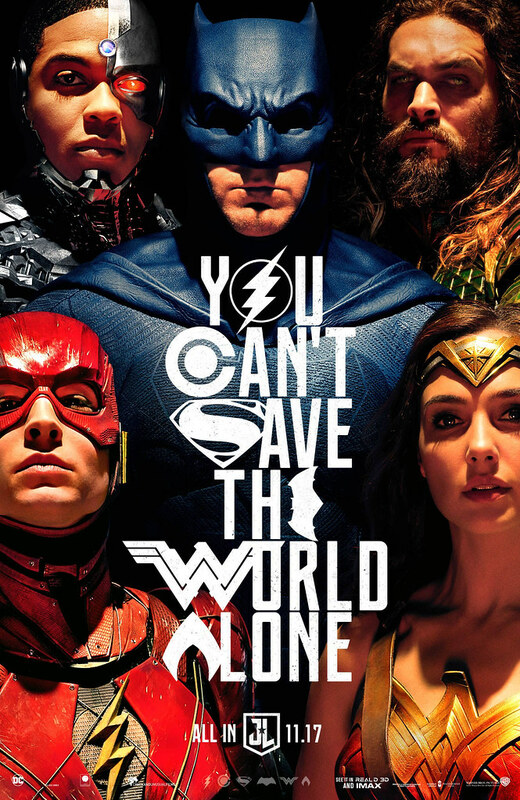 The term of Justice League is too overkill because I don’t think this film is about all of them. It’s more like Captain America: Civil War (2016). There are many superheroes in it but the main spotlight is still for one, which is Captain America. That’s what happened in Justice League. It’s rather disappointing really, though I have to admit that at some points, this film is not too bad. Another thing that rather disappointing is the villain. Ciarán Hinds did well in portraying Steppenwolf, but I was hoping he would be more evil with clear purpose. The final battle was supposed to be intense but I found it disappointing. Too anti climaxing without any excitement at all. Surely some action sequences are good and tense, but unfortunately, they weren’t able to keep it up until the very end. The solution is just too simple and not at all mind-blowing. It’s like they wanted to make a film about an armageddon but somehow, it doesn’t feel like it. To me, it doesn’t feel like the end of the world. I must say, Steppenwolf is a very disappointing villain and actually very weak—at least in this film. Overall, I didn’t put many high expectations for this film because I’ve heard so many bad reviews before. That is perhaps the reason why I found Justice League not as bad as other people think. I mean, there are certainly many flaws here and there but I really think the action sequences are not that bad either. In the least, they are pretty tense and entertaining. Well, in my personal opinion, don’t expect too much from Justice League and therefore, you won’t be too disappointed with the film. Since I didn’t expect Justice League to be great, I found myself quite satisfied with the end result. Certainly, I would want something more from DC, but I did enjoy watching Justice League, though I can’t say the same for DC superheroes fans. For a giant blockbuster film, Justice League is perhaps a bit—if not, very—disappointing, but still, it managed to entertain the viewers even for the least. I give Justice League 7 out of 10 stars. Great review. As always 😀I have yet to see the film myself, but have read mostly mediocre or bad opinions on this film. It doesn’t really bother me though, I’m still going to go and see it anyway as I like superheroes.